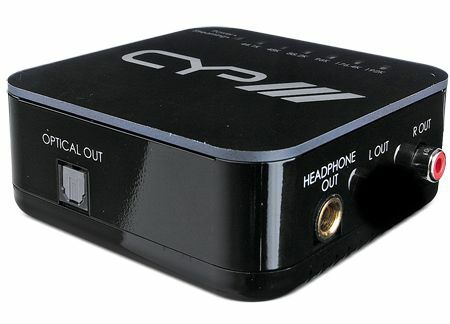 CYP AU-D160 review | What Hi-Fi? If the size of its product catalogue is anything to go by, CYP has a little box of electronics for all occasions. A lot of it is aimed at the professional or ‘custom install’ market, but there’s more than enough to pique our interest. Take the AU-D160. This little black box has plenty going on. It’s a (micro) USB-to-optical convertor, it’s a (micro) USB-to-stereo RCA DAC, and it’s a headphone amp. It’s powered by your source via USB, and aside from inputs and outputs there are some overly bright telltale lights to indicate a) it’s working and b) at what sampling rate. That’s the lot – frankly that’s plenty for a box measuring 4x9x9cm. A different sound – but better? Functionality is all very well, but without performance it doesn’t count for much: sad to relate, this is the first CYP product we’ve tested that’s been disappointing. The obvious use for a USB DAC (or headphone amp, for that matter) is to offer an improvement on the (theoretically) indifferent sound of music stored on a PC or Mac. But when wired between our standard Apple MacBook and reference Bryston pre-amplifier, and given an uncompressed file of The Hold Steady’s Sequestered in Memphis to convert, the sound is simply different from – rather than better than – the sound the Mac makes when connected to the Bryston via its headphone socket. It certainly sounds more spacious, and offers a touch more midrange clarity. There’s no doubt it digs a little deeper and hits a little harder where the low end is concerned, too. But it’s less well organised than the Apple’s internal DAC, with a much vaguer grasp of timing and integration and, as a consequence, music is more difficult to follow and rhythms don’t snap as they ought. It’s a similar story when using the headphone section: a superficially more attacking presentation, comprehensively undermined by lumpy, uncertain timing. We’d always recommend using a DAC when accessing hard-drive-stored music. Just not this one.